Invited by the curatorial team of Artissima’s Back to the Future section, EXILE is pleased to announce the first solo presentation of the work of Kazuko Miyamoto as part of Artissima’s section Back to the Future. Moving to New York from her native Japan at the age of 22 in 1964, Miyamoto quickly started working within the burgeoning minimalist scene of that time. Whilst closely interacting and observing the Minimalist movement Miyamoto developed her very own distinct artistic practice, a blend of her Japanese heritage and issues in minimalism, as well as her identity as a woman within this masculine dominated scene. Working across all media from painting to drawing, sculpture to video, performance to dance, Miyamoto has created a complex, though sadly underrated and partially unresearched oevre that deserves deeper appreciation and research. In 1972 Miyamoto was a founding member of A.I.R. gallery, the first female art collective, building a collaborative platform upon which female artists could present their works to the public. Here, she has had her first solo exhibitions and curated various group exhibitions together with artists such as Ana Mendieta and especially Nancy Spero. Later, in 1982, becoming increasingly engaged in a collaborative and immersive practice, she founded Gallery OneTwentyEight, which, until today, operates out of its original location and is the longest artist-run, community art space in New York. The works on display at Artissima focus on Miyamoto’s minimalist roots and their adaptation within her own unique practice. Issues of overarching structure and order become undermined by individuality, play and chance. As a starting point, the presentation begins with one of her few surviving early paintings Untitled (1972) in which Miyamoto paints an accurate grid upon which she uses spray-paint, a medium that often unstable and hard to control, resulting in a lose disarray of pattern. This painting has recently been on display as part of the exhibition Conceptual Tendencies at the Collection Daimler Contemporary in Berlin. Her modular sculpture Hatbox (1975) functions as a transportable sculpture that introduces the tension between order and play into the gallery space. Packed neatly into an hexagonal painted artist-made box, equal amounts of hexagonal and triangular forms made from gold spray-painted parts of sheet rock form a certain kind of game, solely to be played by the artist herself or other individuals authorized by the artist. 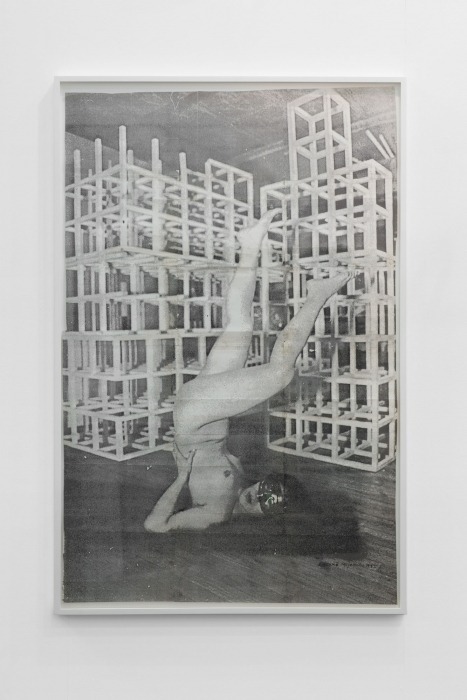 Her enlarged photocopy work wittly entitled Stunt (1982), a result of a private performative action in the artist’s studio, shows the artist herself naked doing a shoulder stand in front of an open cube sculpture by the artist Sol LeWitt, for whom she worked since 1968 and shares a life-long friendship and appreciation. This work brings Miyamoto’s practice rather distinctly to a focal point, critically addressing the problem of subordination of an artist’s individuality under a perceived rigid structure. At Artissima, this unique large photocopy piece is presented for the first time to the public since 1988. Further works on display include a selection of smaller photocopy works that show Miyamoto’s personal examination of minimalist artistic practice in relationship to her own individuality. One of these, the four-part work Untiled (1988), consists of four repetitive photocopies of wooden cut-off pieces placed directly onto a copy machine that can be arranged freely without any given instructions creating open possibilities for interaction and display. Miyamoto has participated in numerous solo and group exhibitions, amongst them: John Webber Gallery, Kunsthalle Krems, Marilena Bonomo and Allessandra Bonomo Gallery, 55 Mercer Gallery, Storefront Gallery for Art and Architecture and the National Museum of Modern Art, Kyoto. She has held three solo exhibitions at Exile Gallery and has recently exhibited as part of the exhibition Conceptual Tendencies at Daimler Contemporary Collection. For 2014 EXILE is proud to announce that Miyamoto was awarded the Joan Mitchell Foundation Archive grant. The recently published monograph on the work of Miyamoto with texts by Luca Cerizza, Lawrence Alloway, Janet Passehl and Marilena Bonomo will be available at the booth and at the Liberia Luxemburg bookstore at Artissisma.